Any guidance will be greatly appreciated! 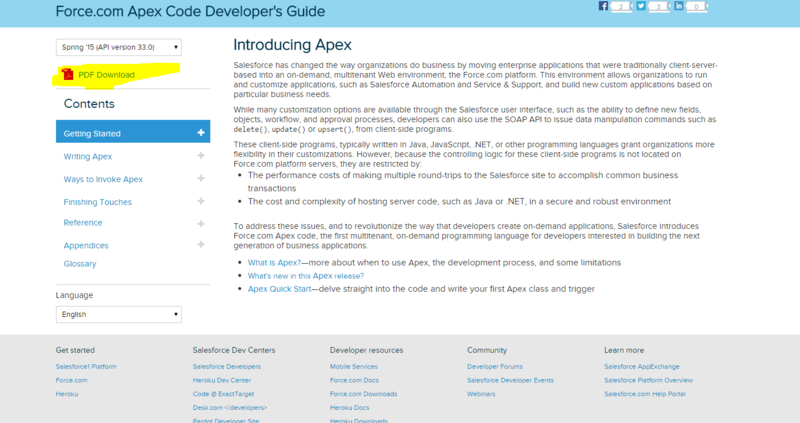 On the same site www.salesforce.com/us/developer/docs/apexcode/index_Left.htm u will see pdf download on the left side to download apex developer guide. Not the answer you're looking for? Browse other questions tagged apex documentation or ask your own question. Attachment trigger not firing, is this a bug? List custom setting works with getOrgDefaults() - should it? Working links for old 3-panel docs? Why documentation deep links are broken? Why is the Salesforce developer documentation NOT indexed on Google anymore?